We are hosting a memorial conference at Arché, St Andrews, to celebrate the life and work of Josh Parsons. Speakers include: Roy Cook, Joe Diekemper, Patrick Greenough, Katherine Hawley, Carrie Ichikawa Jenkins, Dan López de Sa, Daniel Nolan, Simon Prosser, Agustin Rayo, Marcus Rossberg, Robbie Williams, Crispin Wright and Elia Zardini. It is going to be a proper celebration: full of philosophy (done in Josh’s style), laughter, great memories, a little whisky (of which Josh was a bit of an expert), and experimental eleatic hangover cures. We would have liked to have invited many more people. Josh influenced and was close friends with lots of philosophers—in New Zealand (particularly Otago), Australia (particularly the ANU), Oxford, California, and beyond. He was loved and greatly respected by many. So, we have decided to have a Flash Workshop at the end of the conference. 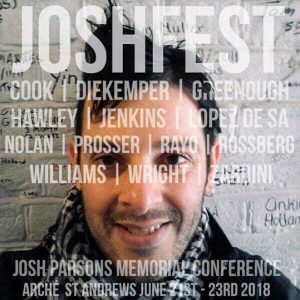 Anybody—doesn’t matter if you knew Josh personally—who wants to show up can give a very short talk on Josh, on Josh’s inspiring reflections on mental illness, on Josh’s philosophical work, on work that grew out of interaction with Josh or his work. Just turn up to celebrate Josh. The Flash Talks will be around five minutes long. To register for this event please visit our online shop.